Anterior view of the right pronator teres. The brachioradialis is ghosted in. Permission Joseph E. Muscolino. 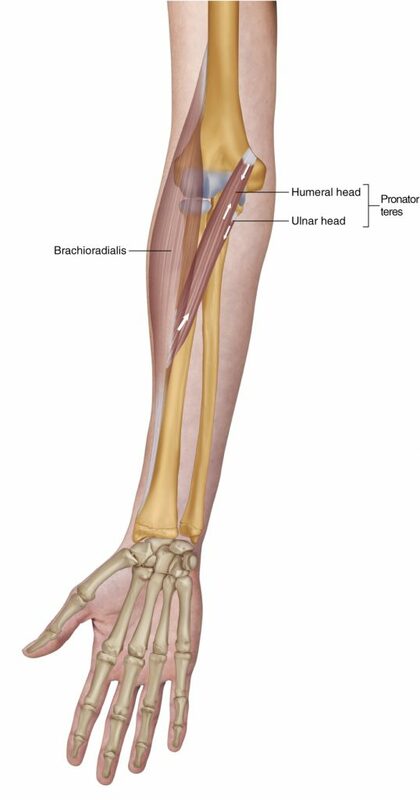 The pronator teres has two heads: humeral and ulnar. The pronator teres attaches from the medial epicondyle of the humerus (as part of the common flexor belly/tendon) and the medial supracondylar ridge of the humerus (humeral head) and the coronoid process of the ulna (ulnar head) to the lateral radius. The median nerve runs between the two heads of the pronator teres and may be compressed there. When this occurs, it is called pronator teres syndrome and may be mistakenly diagnosed/assessed as carpal tunnel syndrome. Because its proximal humeral attachment is part of the common flexor belly/tendon at the medial epicondyle of the humerus, the pronator teres can be involved in golfer’s elbow (medial epicondylitis/osis).